THE VIE W FRO M TH E A LTA R WAS A S EN D LE SS A S OU R LOV E .
What’s more romantic than an Emerald Coast sunset? Our cover couple’s swoon-worthy ﬁrst kiss as husband and wife in front of the iconic sherbet sunset hues. Our  cover exudes Charlie and Leah Escher’s love for one another. The Henderson Beach Resort & Spa’s gorgeous grounds and this couple’s aﬀection lent to priceless moments captured by Michael K Photography. The Henderson was a go-to date spot for dinner and cocktails. The ﬁrst time they went, Leah couldn’t help but think it would be a beautiful venue for a wedding. She couldn’t have been more right! The couple loved the beaches of their home in Destin but recently moved to Palmdale, California, where Charlie is stationed in the Navy. The Emerald Coast and The Henderson will always hold a special and sincere spot in their hearts. Your Moment of a Lifetime. Downtown boutique event space to host gatherings of up to 120 people. Perfect for receptions, showers and rehearsal dinners. Providing creative catering, mobile craft cocktails, and exceptional service to make your wedding day as truly unique as you are. With your Pinterest board active and your phone full of apps, Northwest Florida Weddings Magazine’s website is a convenient, informative and on-trend resource you should add to your wedding planning toolbox. Scroll, click and search our site for insightful stories, talented photographers, stunning venues, mouthwatering caterers, planning guides and much more. Our click-thru showcase pages provide additional layers of information about each vendor featured within the magazine. From sandy shores to luxurious hotels to oak-shaded plantations, explore the vibrant and romantic wedding scene that Northwest Florida furnishes. We love to share the beauty of Northwest Florida. During 2019, we will be attending bridal shows in order to showcase why Northwest Florida could be your ideal wedding or honeymoon location. Check out our events calendar to see if we will be in a city near you. 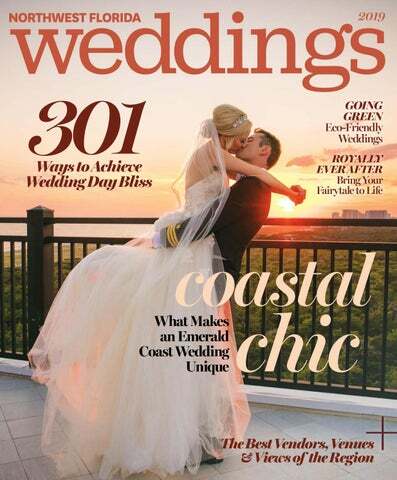 » DIGITAL EDITIONS Need a copy of Northwest Florida Weddings Magazine everywhere you go? Our digital editions provide the exact same pages but clickable! It’s the same magazine you know and love with easy, virtual access. » WEDDING BLOG We vow to keep you apprised with the latest in trends and tips through our blog section, which features topics ranging from floral décor to budgeting. our website for a chance to be featured in our real weddings blog. Visit NorthwestFloridaWeddings.net/Submit-Your-Wedding to enter your love story. SALES MANAGER, EASTERN DIVISION Lori Magee Yeaton SALES MANAGER, WESTERN DIVISION Rhonda Lynn Murray DIRECTOR OF NEW BUSINESS, EASTERN DIVISION Daniel Parisi DIRECTOR OF NEW BUSINESS, WESTERN DIVISION Daniel Parker ADVERTISING SERVICES COORDINATORS Tracy Mulligan, Lisa Sostre ACCOUNT EXECUTIVES Makenna Curtis, Julie Dorr, Margaret Farris, Darla Harrison MARKETING MANAGER Kate Pierson INTEGRATED MARKETING COORDINATOR Javis Ogden CLIENT SERVICES COORDINATOR Charles Shelton SALES AND EVENTS COORDINATOR Mackenzie Little SALES AND EVENTS ASSISTANT Abby Crane WEB/DIGITAL DIGITAL EDITOR Janecia Britt DIGITAL INTERN Samantha De Oliveira Northwest Florida Weddings Magazine is published annually by Rowland Publishing, Inc. 1932 Miccosukee Road, Tallahassee, FL 32308. (850) 878-0554. 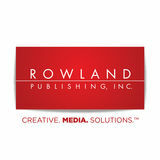 Northwest Florida Weddings Magazine and Rowland Publishing, Inc. are not responsible for unsolicited manuscripts, photography or artwork. Editorial contributions are welcomed and encouraged but will not be returned. Northwest Florida Weddings Magazine reserves the right to publish any letters to the editor. Copyright March 2019 Northwest Florida Weddings Magazine, Inc. All rights reserved. Reproduction in whole or part without written permission is prohibited. Partners of Visit Tallahassee and Member, Greater Tallahassee Chamber of Commerce and Florida Magazine Association. Visit us online and check out our exclusive Photographers Index. Youâ&#x20AC;&#x2122;ll have access to photographer bios and their work in past issues. It will also send you directly to their blogs and portfolios. Want to get in touch with a photographer? Their contact information can also be found online. Wedding bells are ringing at the beach! Resort Collection, located in beautiful Panama City Beach, Florida, has everything to turn your wedding dreams into reality! Say “I do” on the beach, by the pool, or in our newly renovated conference center. Our customizable packages and professional wedding planners help make your wedding as unique as you. Reference this ad to receive a complimentary room for your wedding night when you book your wedding with Resort Collection. Coast (noun): 1. Sugar-white sands leading to emerald green waters. 2. Luxury resorts overlooking stunning watercolor sunsets. 3. Enchanting, goldenhour backdrops to vow to forever. 4. Footprints in the sand, hearts on permanent vacation. From the rustic romance of historic Apalachicola to the » elegant sugar sands of Destin beaches to the pristine white walls of Alys Beach. your ideal venue awaits. e can all agree that beaches are beautiful. The lull of waves, the soft sand, the picturesque sunsets like brushstrokes from the color palette of a talented artist. There are many beaches, in Florida and beyond, but there’s something so alluring, so enchanting, so truly special about Emerald Coast beaches. The Emerald Coast’s claim to fame is in the name — emerald waters. This brilliant blue-green enlivens photos and is a sure signifier that your wedding was an Emerald Coast affair. The other contender is the sugar-white sand. “The sugar white sand and emerald green waters are only located in certain parts of the world, and we are lucky enough to have it in our backyard,” said the staff of Hilton Sandestin Beach Golf Resort & Spa. “Our beachfront location gives you a stunning backdrop as you exchange your vows to a Gulf soundtrack.” Not only is the sand soft as the finest cotton, it pairs perfectly with your white wedding dress. The sand’s iconic hue actually inspires many coastal brides to have all white weddings. Venues, including the WaterColor Inn & Resort, have noted that many of their brides opt for white as the most prevalent wedding color with complementary shades of gold or blush. Beyond the sand, white is an influential color on the Emerald Coast. Take, for example, the iconic stark-white walls of Alys Beach, the white picket fences of Seaside or the whitewashed facades of Rosemary Beach. contemporary, sleek and sophisticated for a style that is specifically Emerald Coast. Wed inside an architecturally distinguished venue or be silhouetted by the best sunsets in the world. City (noun): 1. Bright lights, glittering skylines, bustling streets, electric synergy. 2. Historic downtowns lined with hotels, dining and shopping. 3. Contemporary cool venues for the city-centric couple. 4. Modernity mingled with lasting love. “The women working at The Gathering and Social Catering were incredibly flexible and accommodating. They helped me feel comfortable with the decisions we were making and gave us so much confidence that the day would turn out spectacular. They helped us decorate and let us use vases and other decor that were available in-house. I felt good knowing that someone knew every detail of where things needed to be and when. Every woman wants to feel like a princess on her wedding day. Why not act the part? Hereâ&#x20AC;&#x2122;s how to get that royal look from across the pond. t’s no doubt that 2018 was a big year for the royal family. With the nuptials of American actress and humanitarian Meghan Markle to Prince Harry, Duke of Sussex, and the wedding of Princess Eugenie of York to Jack Brooksbank, it’s understandable to feel bitten by the royal bug. It’s hard to think that any dress could top Kate Middleton’s Sarah Burton for Alexander McQueen gown. The Duchess of Cambridge’s dress, which combined tradition and modern details, is still talked about today. The style, a hallmark of McQueen, was inspired by the Victorian tradition of corsetry and the bodice, skirt and underskirt trim of the dress were created out of an English and French Chantilly lace. All of these details are what made Middleton’s dress a showstopper. “Kate Middleton’s dress, in a way, epitomized the Southern look with all of the delicate details,” said Maggie Matthews, the owner of Margaret Ellen Bridal in Inlet Beach. However, Meghan Markle’s Clare Waight Keller for Givenchy wedding dress has made an impact of its own. “I think Meghan Markle inspired more brides to go for that simple, clean and chic look. Meghan has allowed brides to embrace an understated beauty,” says Alex Barnes of Tallahassee’s White Wedding Bridal. Eugenie, Princess of York, is a personal favorite as her wedding look was traditional yet effortless. The dress, designed by Peter Pilotto and Christopher de Vos for Peter Pilotto, was white satin with floral appliqués, long sleeves, an open back, off-the-shoulder neckline and a statement train that seemed to go on for miles. Her look was minimal yet breathtaking, showing off Eugenie’s beauty while also including subtle nods to her heritage, such as embroidered York roses and Irish shamrocks. “There are wedding reception venues, and then there is Hotel Duval. In 2009, when Hotel Duval opened, I remember thinking, ‘One day when I meet the right man to share my life with, I want our wedding reception to be in the Horizon Ballroom on the eighth floor of Hotel Duval.’ Well, my dreams came true, meeting the perfect man and having the perfect wedding. Country (noun): 1. Ancient oaks, rolling hills, sparkling stars, swaying wildï¬&#x201A;owers. 2. Rustic barns, stately plantations and gorgeous gardens made to be ideal venues. 3. Natural beauty and idyllic scenery. 4. Love that blooms, blossoms and grows. Dream Weddings Right on the beach! PEARL IN THE WILD is a wedding and event venue for Tallahassee, Florida. 10,000-square-feet with a chapel situated on 200 lush acres with unlimited possibilites. new by giving past items a new purpose. Have fun with your fiancé by shopping garage sales and antique stores for glass bottles, vases, décor and more. Select sprigs of wildflowers in glass bottles for sustainable table toppers. recycled, reconditioned, nontoxic, upcycled, environmentally conscious and natural. Each year, Sustainable Tallahassee hosts the Recycled Wedding Market, in which previously used decor, linens, dishware, dresses and more are sold to engaged couples to be recycled and reused in a new wedding, in a new way. It is likely your community does something similar, and there are many online resources that sell used wedding items. The goal is to not add to landfills. You can rent or borrow linens, glasses, plates and silverware. There are many brands that carry compostable serving ware options made of birch wood or bamboo, two fast-growing, adaptable trees. The best way to determine if your vendor is eco-friendly is to ask questions. For catering and bartending services, inquire if they will recycle any container, boxes or glass bottles that are used. Food is another resource that often goes to waste. The caterer might already have a location they donate leftover food to, but if not, you can research local charitable locations that will accept leftovers. Have a plan in place of a family member or friend that will take the food to the location after the wedding. Putting compost and recycling baskets near food and drink stations is a great and easy way to ensure nothing goes to waste. Many counties loan recycling receptacles for free — all you have to do is pick them up. You can also donate your remaining flowers to hospitals or hospice houses to ensure days are brightened twice. Ask your florist if locally sourced flowers are an option as nationally and internationally shipped flowers negatively impact the environment. Tallahassee bride Katie Britt — soonto-be Britt-Williams — is using native North Florida wildflowers from Azalea Hill Farm. Britt holds a master’s degree in natural resources and will be expanding her love of this earth into her wedding by using all local and sustainable vendors. “Big events just create so much waste, and I knew I wanted a big wedding with a lot of people, which tend to have an even worse carbon footprint,” said Britt. Making It Happen (verb): 1. Qualiﬁed and caring vendors. 2. Years of experience making couple’s dreams come true. 3. Service providers that exceed your expectations. 4. Miracle workers that help shape the most memorable day of your life. that’s your abuela’s tamales or traditional dim sum, there are so many caterers that can help bring in the spirit of your families. “This is the biggest meal of their lives. We always meet with the bride and groom first and love to hear more about their families, where they are from, how they met, favorite meals or traditions and really incorporate all that into the menu. We want the menu to tell a story. We’ve done some really cool weddings in the past — a Brazilian and Southern fusion, a Sri Lankan and Lebanese fusion menu and even a Boston meets Argentina menu,” says Briana Edmunds, event manager for Liberty Bar & Restaurant. Thinking of that dish that only your grandmother or favorite uncle can make? Get them involved in the planning. Collect recipes and share them with your caterer or even use them as wedding favors for your guests. “We’ve had family members share recipes with us, such as a bride’s grandmother’s caramelized pineapple curry or a family recipe for Pão de queijo, a Brazilian cheese bread. “John Gandy and his team gave us the most magical and absolutely perfect wedding we had always dreamed of. There are so many things that you don't even think about when planning a wedding that you truly need a professional like John to make sure everything goes off without a hitch. The level of customer service and professionalism from their team is unmatched. Many brides want a bit of dazzle in their do — from ornate, gilded gold hair clips to intricately wound, delicate vines. Diamonds aren’t always a girl’s best friend. Sometimes, she prefers a unique yet equally stunning gemstone. From conversational and quirky bow ties to suits that transcend past black and classic — the men might just be stealing the show. Your grandmother’s brooch on your bouquet, your grandfather’s watch, a piece of your mother’s wedding dress sewn into yours — beautiful sentiments included in your most memorable day make for everlasting memories. White flowers are having a major moment right now. Simple, stylish and timelessly elegant. Invitations, table markers, backdrops and more — you name it and you can stylize it with curly cursive calligraphy. Couples are opting for optimal party time with passable food options. No need to sit when you can dance with grilled cheese in hand. From accent sprigs to lush tablescapes, brides and grooms are going gaga for fresh greenery. Make them remember you long after you’re gone with an exciting exit that’s unique to you. Capture the moment as it happens. Guests love hamming it up with keepsakes from an on-site photo booth. For all your bachelorette events/excursions, the event and entertainment choices are endless — and all on 850Tix.com. here are few moments at a wedding more joyous than witnessing your family and friends smiling, laughing, singing and tearing up the dance floor. There are few moments more tear-jerking than the father of the bride and mother of the groom dance. There is no moment more defining than the walk down the aisle to the love of your life. The vital factor that all of these moments have in common is music. With music being such an influential aspect, it’s important to know what option is best for you — DJ, band or being your own music master. Each has its positives and aspects you should be aware of before making a decision that could affect the overall tone of your wedding day. DJs are a widely chosen option as they are allinclusive. Most offer a package deal including ceremony and reception music, emcee services and all technical equipment and lighting. In essence they are professional party starters that keep the mood and music pumping throughout the night. Some completely entrust their DJ with selecting the right tunes, but others opt to meet with their DJ beforehand to ensure their favorite songs are played and to see if they mesh well with the master of ceremonies. To some, there is nothing like the sound and the feel of live music. A live band is entertaining and enjoyable, encouraging you to revel in the talent of the musicians while taking to the dance floor. Much like a DJ, a band can be emcees, provide all equipment, create a song list and create an interactive experience. playlist curated by you. Each option presents unique ways to get the party started. RUSSELL RAINEY, DMD Say “I Do” with a perfect smile. Dr. Russell B. Rainey and his caring team provide Tallahassee’s most exceptional dental experience. Dr. Rainey’s practice offers a wide range of services, including teeth whitening, Invisalign treatment, and anxiety-free cosmetic and restorative dentistry. Whether it is your big day or the big day of a loved one, let Dr. Rainey’s team give you a smile to be proud of. TOP SHELF BAND Looking for a live band that will make your Big Day even more memorable and keep your guests entertained? Top Shelf Band is a 6-piece versatile high energy wedding band that will bring the party! Top Shelf Band covers a wide range of genres and decades of music to keep everyone captivated. The band is flexible and adaptable to meet your needs — providing full sound and stage lighting systems and MC services to tailoring songs lists to achieve your desired reception atmosphere. Book now to reserve this highly entertaining band that will wow you and your guests! making it happen VOCELLES | THE BRIDAL SHOPPE Since opening their doors in 2010, Vocelles Bridal has been the premier shopping destination for brides in North Florida and South Georgia. The team at Vocelles Bridal is passionate about creating a true experience for their brides, while offering an extensive collection of designer wedding gowns from the most trusted names in the industry. THE WEDDING SUITE The Wedding Suite is home to Tallahassee’s most experienced wedding professionals. Our members offer luxury products, exceptional service and a commitment to provide the best wedding experience available. Between our talented wedding professionals and all of our amazing associate members, we have every detail of your special day covered. HAMPTON INN AND SUITES TALLAHASSEE I-10 Convenience and comfort is key when planning a wedding stay, whether it is for the happy couple or the guests. Hampton Inn and Suites is centrally located just off I-10 in Tallahassee making it an easy drive to nearby wedding venues and downtown. The recently renovated hotel features cozy beds, an outdoor pool, fitness room, a welcoming staff and ultimate comfort for a wedding weekend. HILTON GARDEN INN TALLAHASSEE Tallahassee’s best location for comfort, service and convenience to accommodate you and your loved ones as you celebrate your wedding. Our light-filled lobby, on-site restaurant and clean, fresh rooms create the perfect “home away from home” experience. We are centrally located near several of Tallahassee’s wedding venues, just off I-10 at exit 203. In addition to reserving your sleeping-room block, let us take care of your rehearsal dinner as well. With full-service catering available, our banquet room offers an ideal setting for an intimate rehearsal dinner of up to 48 guests. MY FAVORITE THINGS From your invitation to your registry, everything you choose is a reflection of your personal style. The consultants at My Favorite Things can guide you with their expert knowledge in everything from etiquette to entertaining. With our extensive online registry service, you and your guests can access an array of beautiful and unique gifts that will complement the exciting new life ahead of you. TALLAHASSEE AUTOMOBILE MUSEUM – BANQUET ROOMS The Tallahassee Automobile Museum is a community treasure that offers up history and engaging experiences. For a reception or ceremony that’s outside of the box, the museum is equipped with a variety of banquet rooms ranging in size and style to seat from 50–1,500 to fulfill the needs of your wedding. Your own caterer and decorations are welcome, while facilities, tables and chairs are on-site to drive your wedding day to blissfulness. making it happen HILTON SANDESTIN BEACH GOLF RESORT & SPA Kissed by the warm, salty breezes of the Gulf, Hilton Sandestin Beach is the perfect choice for the couple in search of a timeless beach ceremony and an overall experience highlighted by unprecedented customer service on the beautiful Emerald Coast. Wedding guests will adore this spot for its understated glamour and gorgeous amenities. This resort can deliver it all, from pre-wedding rituals to post-nuptial relaxation. For the one moment when you say,“I do” there is only one Hilton Sandestin Beach. SERENITY BY THE SEA SPA Be sure to include a visit to Serenity by the sea Spa when planning your wedding weekend activities. The full-service spa at Hilton Sandestin Beach is the perfect place to relax away those pre-wedding jitters with a menu of massage, facial and body treatments. The entire wedding party may enjoy a spa-style bridesmaid’s luncheon in the lounge while beautifying together with hair services, manicures and pedicures in the spa’s adjoining salons. BALLROOMS AND THE BEACH With 60,000 square feet of indoor and outdoor venues, Hilton Sandestin Beach presents a plethora of spots for your ceremony, reception and various wedding gatherings. All of the ballrooms feature an open-ceiling concept that can be transformed into a splendid backdrop for nuptials. If the beach is your ideal venue, three boardwalks lead down to sugar white sands, and three decks overlook the emerald green waters lending to picturesque scenery. SEAGAR’S PRIME STEAKS & SEAFOOD When only the best will do, treat your guests to an event at Seagar’s, the only AAA-Four Diamond-rated steakhouse on the Emerald Coast. Private rooms are available for groups of all sizes, making the New York-style steakhouse perfect for everything from small family gatherings to elegant rehearsal dinners. Our Executive Chef will create a menu to suit your style, featuring Prime beef and fresh-from-the-Gulf seafood. Seagar’s also features the largest wine list on the coast, with more than 600 labels to choose from. SANDESTIN GOLF AND BEACH RESORT Create memories that you will cherish for a lifetime at Sandestin Golf and Beach Resort. Offering the largest selection of luxurious venues on Northwest Florida’s Emerald Coast, Sandestin is the perfect backdrop for your special day. With 15 venues, from sugary white sand beaches and lush green lawns to elegant stately ballrooms and serene bay front terraces, Sandestin is the ideal place to unveil your dream wedding. EMERALD COAST AUDIO VISUAL SOLUTIONS Flawless audio and eye-catching visual services ensure that your guests fully experience the magic of your wedding day. Emerald Coast Audio Visual Solutions equips you with expert technicians and consultants to advise you on the most effective and cost-efficient options for your wedding, whether it’s indoors or outdoors. Every word of your vows will be heard, and the spotlight will be on you. For your rehearsal dinner, outdoor ceremony or reception, the team at Emerald Coast Audio Visual Solutions has the right equipment and expertise for your once-in-a-lifetime event. PROJECT:STYLE SALON Weddings are our specialty. We have formed a creative team unlike any other in the Panhandle, making us one of the most sought-after salons around. Brides and their bridesmaids love our attention to detail. project:STYLE will take great care of your bridal party and create a look every bride dreams about. We offer in-salon and on-site styling for bridal parties. PEBBLE HILL PLANTATION Amid the allure of magnolias and lovely longleaf pines, blooms the stately architectural beauty of Pebble Hill Plantation, providing a grand and breathtaking backdrop for your wedding. Pebble Hill Plantation offers five unique venue options, ranging from elegant to rustic. Incorporate the timeless romance of a bygone era into a wedding that is uniquely yours. Honeymoon (noun): 1. Event after the wedding intended for relaxation and enjoyment. 2. A time to connect and disconnect. 3. Scenic locales, dreamy destinations and beautiful beaches. 4. An adventure of a lifetime with the love of your life. GFWC Womanâ&#x20AC;&#x2122;s Club of Tallahassee Nestled among the oak trees at the entrance to Los Robles is a top venue for parties and events. Plan ahead and save on your next celebration! Traditional or Modern; Classic or Trendy; Intimate or Extravagant… with over 100,000 square feet of flexible indoor and outdoor event space, the University Center Club has something to offer every couple. We believe that planning your wedding should be almost as fun as the big day. No matter what your vision may be, our expert wedding professionals and culinary artists are dedicated to helping you make it all happen. Call us today for a “pre-game huddle” and to tour our amazing venue! Fla. Seller of TravelFla. Reg.Seller No. ST-38182. of Travel Reg. Washington No. ST-38182. Seller of Washington Travel Reg.Seller No. 603118961. of Travel Reg. Wyndham No. 603118961. VacationWyndham Rentals and Vacation relatedRentals marks are andregistered related marks trademarks are registered and/or trademarks service marks and/or in theservice Unitedmarks Statesinand the United States and internationally. All rights internationally. reserved. All Printed rightsinreserved. the U.S.A.Printed 14 Sylvan in the Way, U.S.A. Parsippany, 14 SylvanNJWay, 07054 Parsippany, | ©2018 Wyndham NJ 07054 Vacation | ©2018 Wyndham Rentals North Vacation America, Rentals LLC. North America, LLC. An overview of stunning imagery and descriptive copy about the many colorful wedding scenes in Northwest Florida.